The seat cushions and backrests of the front seats can be heated and ventilated* electrically. – Press the control button for Seat heat. ⇒ fig. 127. 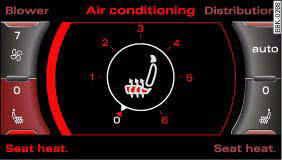 – Press the control button for Seat AC ⇒ fig. 128. – To adjust the seat ventilation, turn the rotary control anticlockwise to the desired setting. 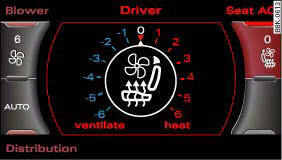 – To adjust the seat heating, turn the rotary control clockwise to the desired setting. In setting 0, the seat ventilation and seat heating are switched off. The seat cushions and backrests of the two outer rear seats can be heated electrically. – Turn the left thumbwheel (on the centre console) to switch on and regulate the heating for the left rear seat. – Turn the right thumbwheel (on the centre console) to switch on and regulate the heating for the right rear seat. The heating is switched off when the thumbwheel is set to 0. Possible settings range from 1 to 6. The heating for the rear seats only operates when a sensor registers the weight of the occupant in the seat. If nobody is travelling on the rear seats, please switch off the rear seat heating to avoid activating it unintentionally.